"Smoky goodness. A friend made this and I have been hooked ever since." Toss Brussels sprouts with 1 teaspoon oil, 1 teaspoon paprika, 1/4 teaspoon salt, and 1/4 teaspoon pepper in a large bowl. Spread on a baking sheet. Roast in the preheated oven until softened, about 15 minutes. Push to 1 side of the baking sheet. Toss kielbasa sausage with remaining 1 teaspoon oil, 1 teaspoon paprika, 1/4 teaspoon salt, and 1/4 teaspoon pepper in the bowl. Arrange cut-side down next to the Brussels sprouts on the baking sheet. Return to the oven and roast until Brussels sprouts are slightly crispy, about 15 minutes more. Toss together before serving. 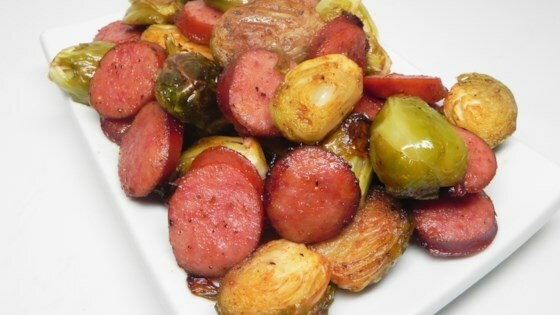 Brussels sprouts and sausage are the perfect pairing! Use 1 to 1 1/2 pounds of kielbasa--smoked, if you can get it in your area. This was excellent! This was the perfect meal to prepare after a long day at work. Super simple, not a lot of fuss, and the smoked paprika really came though. Made this exactly as described. Excellent!!! Wow! My new favorite go to recipe. I added red onion and cooked everything for 30 minutes! Served with pearl couscous. My boys loved it. No leftovers!! The cook time on the Brussels sprouts could be reduced to 10 minutes - mine got charred. Otherwise, easy to make. Giving this 5 stars because it is so easy and tasty. Used turkey kielbasa. It was a hit, not even a word about having to eat brussel sprouts.